The Best of Teacher Entrepreneurs II: Language Arts Product - "English Reference & Style Guide"
Language Arts Product - "English Reference & Style Guide"
I have always been envious of my science and math teachers who have these cute, easy reference sheets and guides for topics and terms they often come back to during different lessons. I also know as an English teacher (and I am sure many of you can agree with me), it is so frustrating having to repeat myself when I have already explained, defined, and reviewed a specific term or technique. 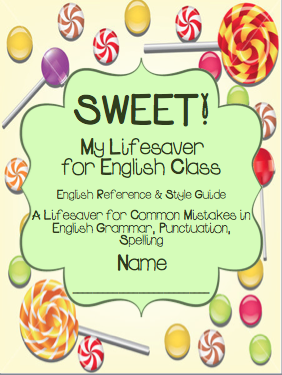 Why not have a reference guide for English?!?!? In this 12-page reference guide, I compiled 12 pages of terms, words, grammar, spelling, and other techniques English teachers most often use, refer to, and repeat.